Amex Offers is one of my favorite ongoing credit card promotions. Why, you may ask? It provides an easy way to get discounts–sometimes substantial–at a variety of merchants. Once you’ve signed up for a particular offer, the discount is done transparently at the point-of-sale, meaning that you can stack any other coupons that you may have on top of the promo, for even more savings. You’ll simply receive a statement credit for the discount once your qualifying purchase(s) have been confirmed. The only issue that those new to Amex Offers may have is that it may seem daunting at first. The reality is that it is quite simple to sign up for these offers and that’s what this short guide intends to cover. Your AmericanExpress.com account – For most people, this will be the easiest way to sign up for Amex Offers. When you log into your online account, near the bottom of the page, there is a section called “Amex Offers & Benefits” In this section, which you can scroll through by clicking the right arrow button on the page, you’ll see a list of Amex Offers available to your account. Click the “Add to Card” button next to a deal to enroll your card in any offer that interests you. Some offers, however, are available to everyone with an eligible American Express card. For instance, all of the offers that you can sign up for on Twitter are available to anyone. For this reason, it’s the Twitter offers that are the primary ones that I write about on this blog. In order to sign up for Amex Offers through one of the social media channels (such as Facebook or Twitter), you’ll need to first connect your American Express card with your social media account. To connect your Amex, you can visit sync.americanexpress.com and click the “Get Started” button next to the social media account you wish to connect. Once you’ve connected your account, you’re ready to sign up for new offers! 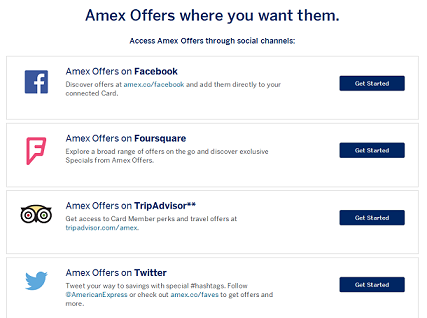 In general, once you’ve connected your Amex to your social media account(s), signing up for new offers is pretty self-explanatory. For instance, to sign up for new Amex Offers in Facebook after you’ve connected your card, visit the Amex Offers app at amex.co/facebook. Click the “Add to Card” button next to any offer you wish to enroll in. Signing up for offers through Twitter is only slightly more complicated. Each promo will have an associated hashtag with it. For instance, a Walmart offer may have a hashtag of #AmexWalmart. In this case, all you need to do to sign up for the offer is to compose a new tweet that includes #AmexWalmart. Once you’ve received notification that you’re successfully enrolled, then use your card to make the required purchase within the offer period. You should then receive your statement credit within 90 days after the purchase has been confirmed (though it’s usually much quicker than that). That’s pretty much all the basics of what you need to know! As always, you can always see a current list of all Amex Offers that are available on Twitter on the automatically-updated list. I have multiple Amex cards. Can I sign each of them up for a specific offer? You are not allowed, however, to sign up for the same offer on the same card through multiple channels, though.